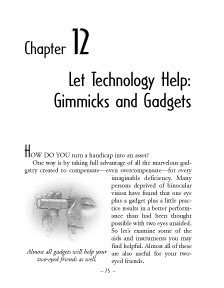 Mr. Brady evaluates much of the available eyewear and other gadgets which help the monocular individual. He also offers some tricks for emergency situations. "Ever get caught in front of a telephone book with no glasses to keep the print from blurring? Here's an emergency measure I picked up somewhere--and have often been thankful ever since.